On April 9 in 1963, a classic of children’s literature, Maurice Sendak’s “Where the Wild Things Are,” was published. It is what is known as a picture book and has been beloved by generations since then. Max, a little boy, travels in his imagination (or sleep) to an island inhabited by wild creatures. “Let the wild rumpus start,” he says! In 1964, the book received the coveted Caldecott Medal. 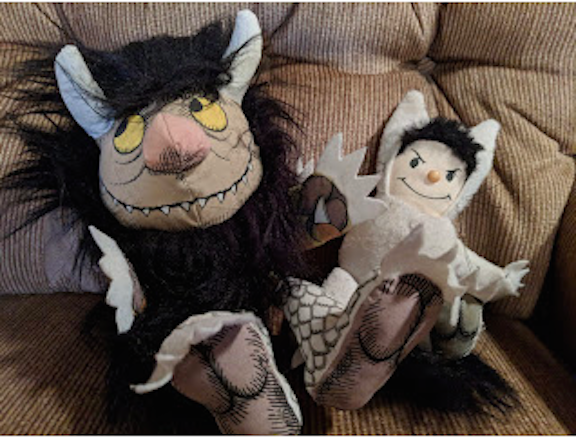 News of this anniversary sent me to my bookshelf to say hello to my “Max” and “Wild Thing” puppets. The book was very cherished by my children and me — of course, a librarian would also have the puppets (even though I was never a children’s librarian). My new copy, complete with the gold Caldecott Medal. You can read more about Maurice Sendak and the book here. A two-part interview of Sendak by Stephen Colbert, one of the last interview’s Sendak did before his death, is also a great delight and can be found here.